Remember how much I love hydrangeas? 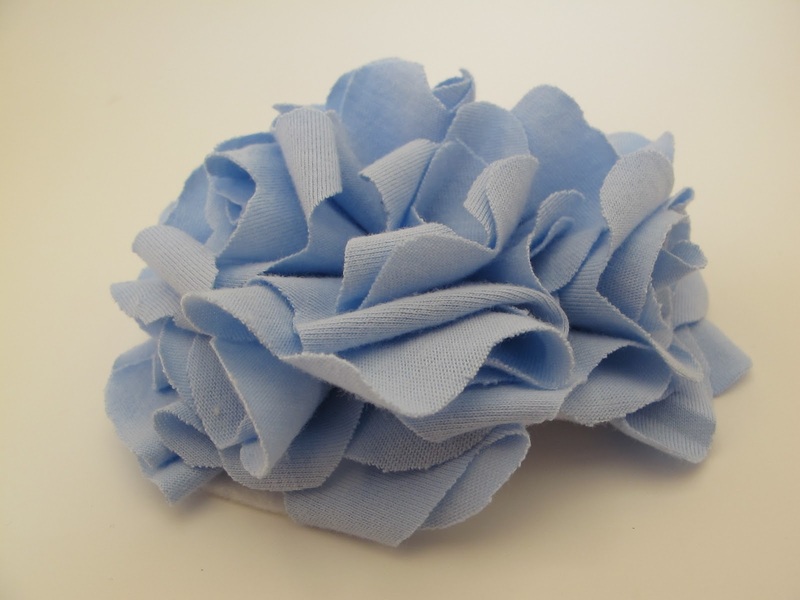 I am so excited that this light blue fabric flower turned out looking just like a hydrangea! 2. 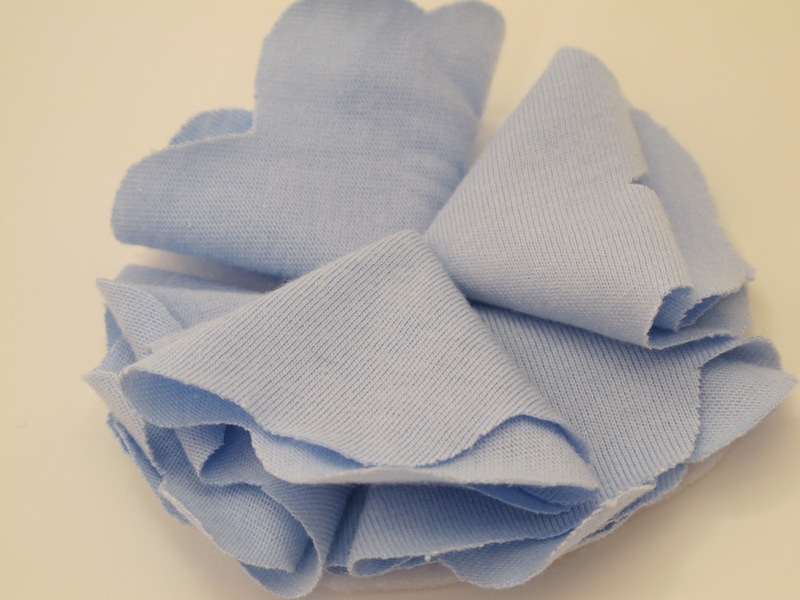 Take the fabric and fold it up about an inch or two (depending on how big you want your flower). 3. 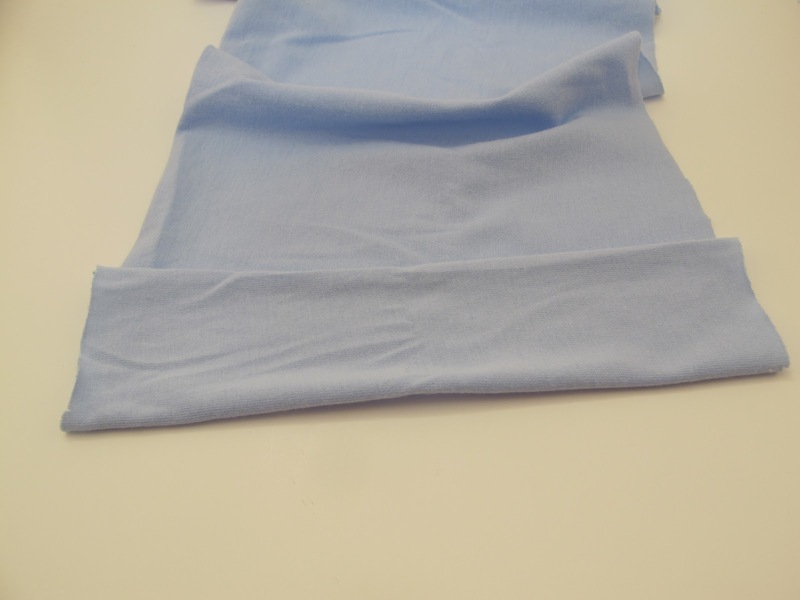 Then fold the fabric in half. You are now going to cut from the bottom right corner that you see above. 4. 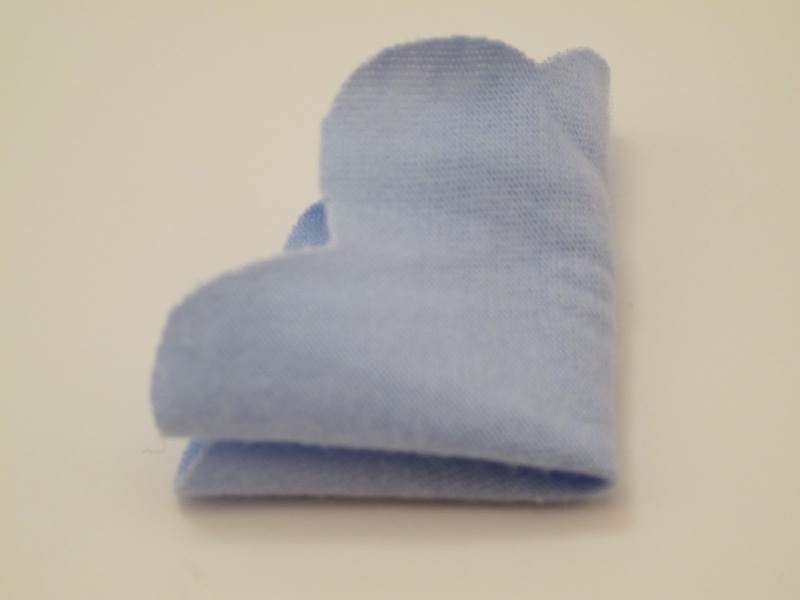 You will cut a heart shape that will look like the picture above. 5. 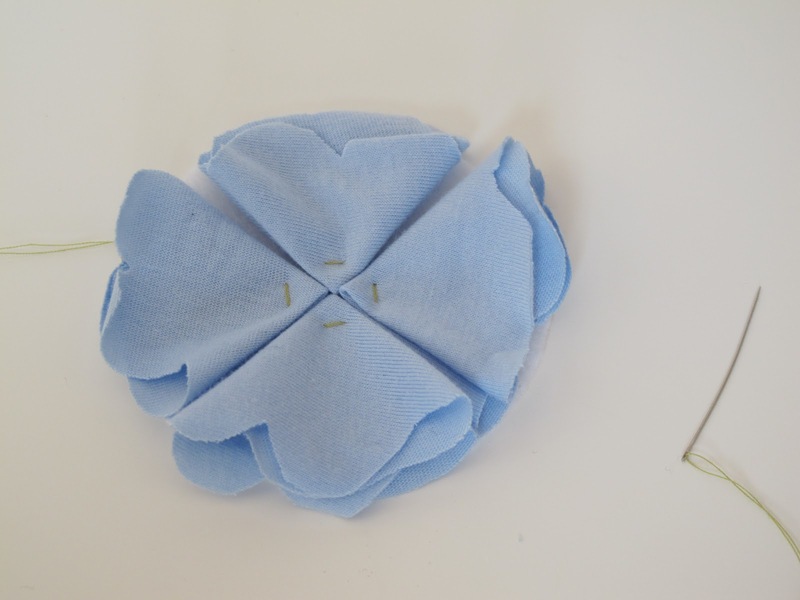 Unfolded, the heart that you cut out should look somewhat like a flower. 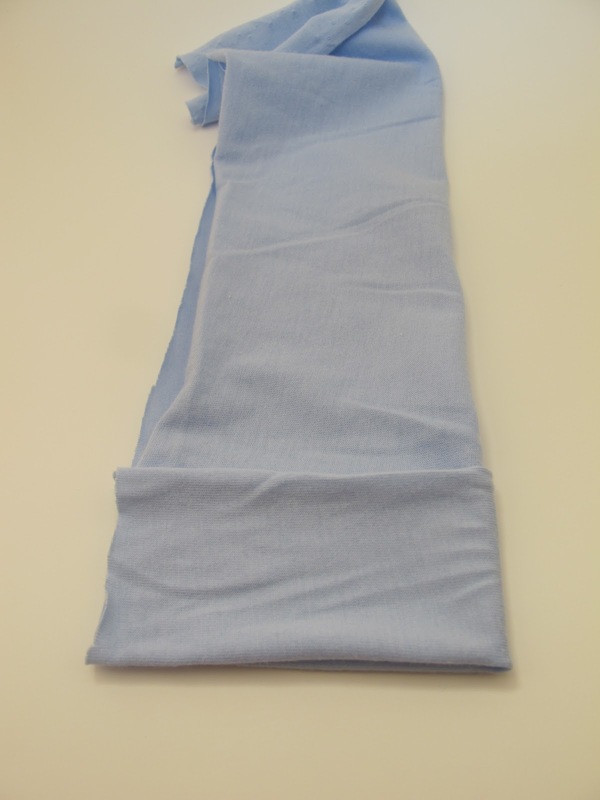 Re-fold the piece (folded 2 times). Make sure you DON'T match up the petals perfectly this time. It should look like the picture above. 6. 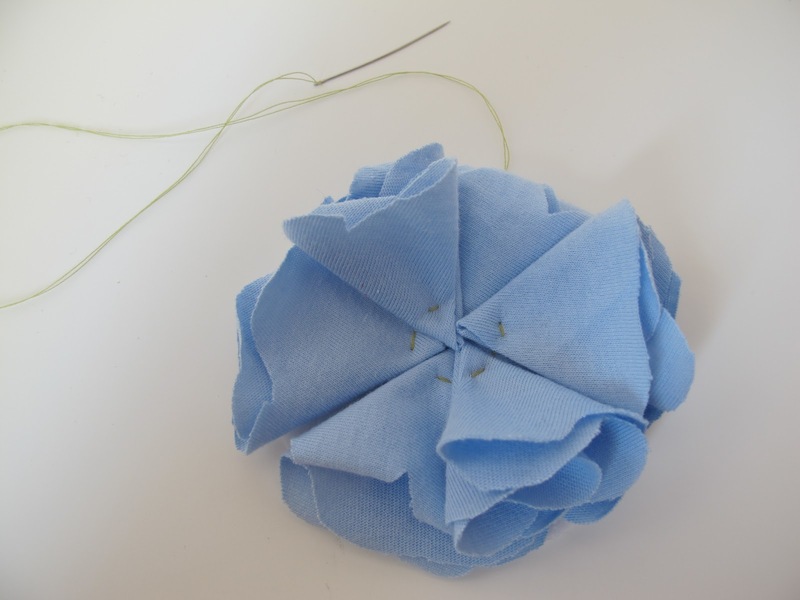 Place your first petal piece on the felt circle. 7. Cut out 3 more pieces in the same way for a total of 4. Lay them all on the felt circle. 8. 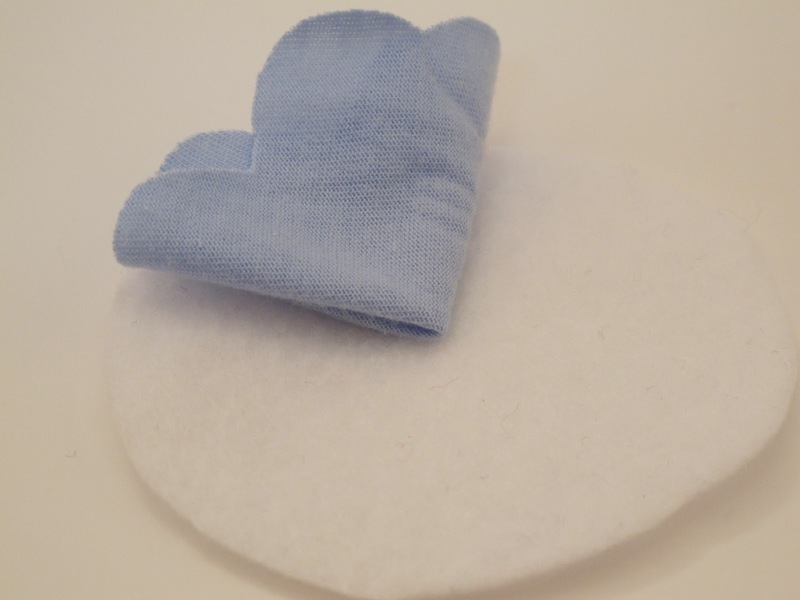 Now you will sew each piece to the felt circle. 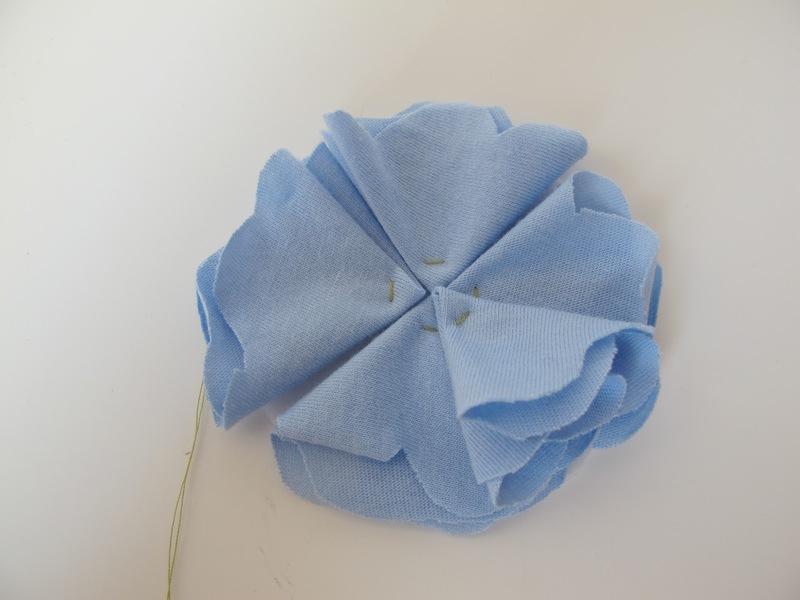 I used a contrasting color so you can see better, but I would suggest using the same color thread as petal. 9. 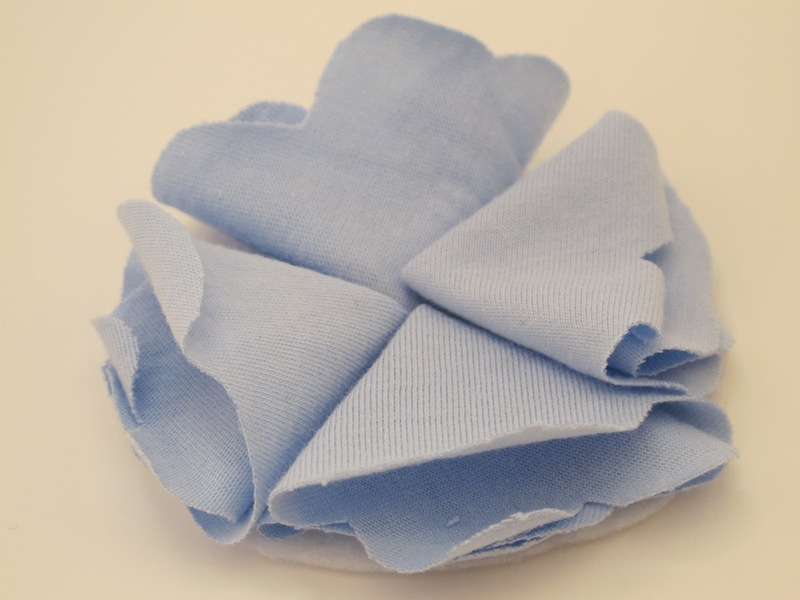 You will continue to make petals, layer them around the circle, and sew them on. 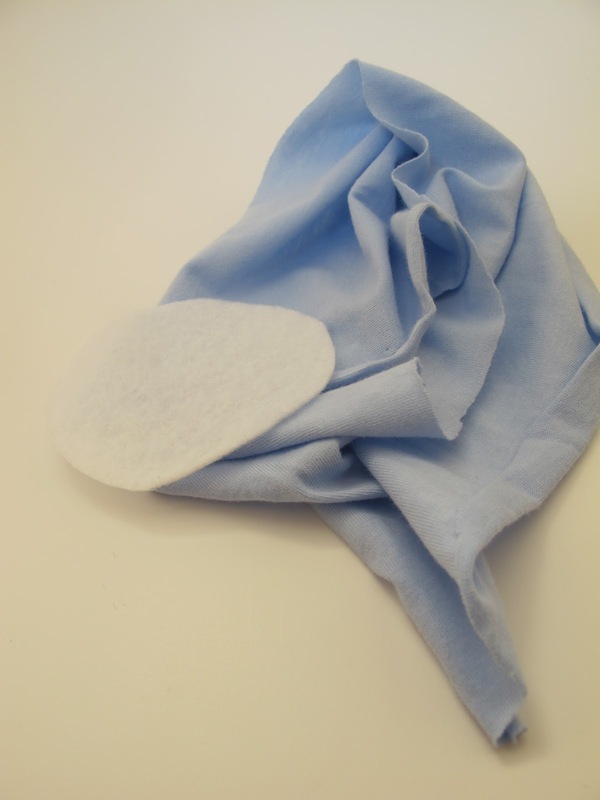 After the first layer of petals, I suggest folding the petal as before, and then rolling them to make the bouquet fuller. 10. The pictures above and below display the process of sewing on a new layer of rolled petals. 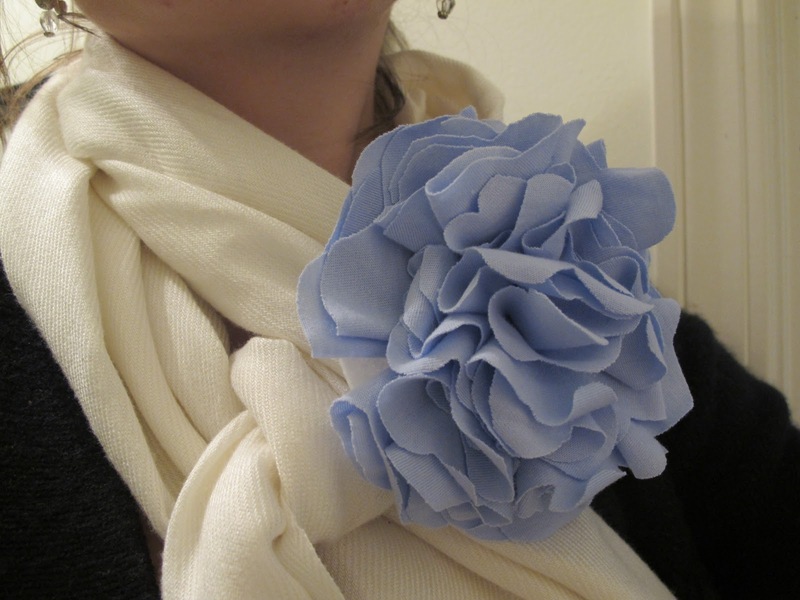 Sew a pin on the back to make for a perfect scarf or sweater broach. These flowers are so quick and a lot easier than they look. I went ahead and made several. There are endless ways to wear these lovelies. The cream and brown flower matches my mom's purse perfectly and so I'll be pinning it on for her next time I see her. Now, for the exciting bit. I've never done this before, but I think it's time for a little GIVEAWAY. 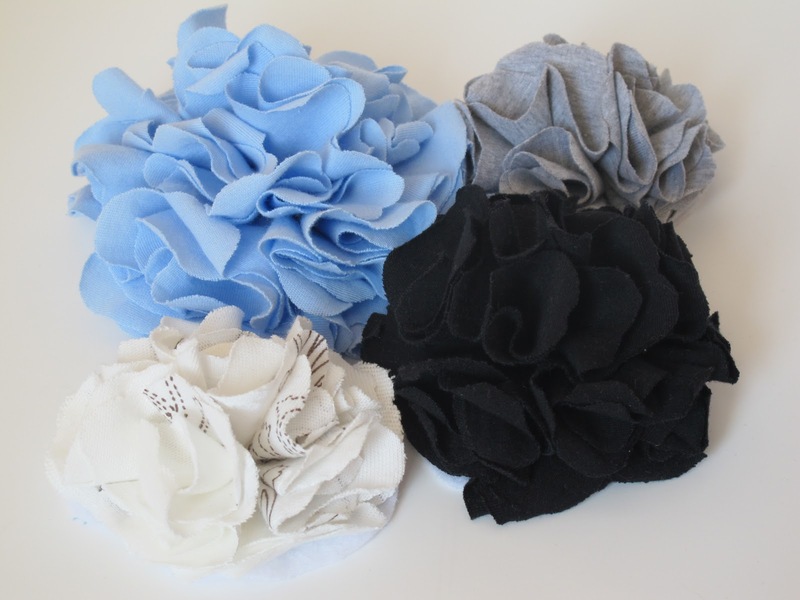 I will pick 2 winners and they will each receive a fabric flower bouquet of their choice and a 10% off credit to my shop, Curtsay Designs! 1. Leave a comment with your email and the color flower you'd prefer. 2. Leave a comment telling me your favorite item in my shop. 3. Leave a comment telling me you follow my blog. 4. Leave a comment telling me you follow my facebook page. The Giveaway will end Midnight (eastern time) Saturday, November 27. I want one of your beautiful flowers (preferably black or pink)! :o) I love getting your posts on facebook - My favorite item in your "store" is the darling white baby hat with a pink flower -- too cute! This is so fun! 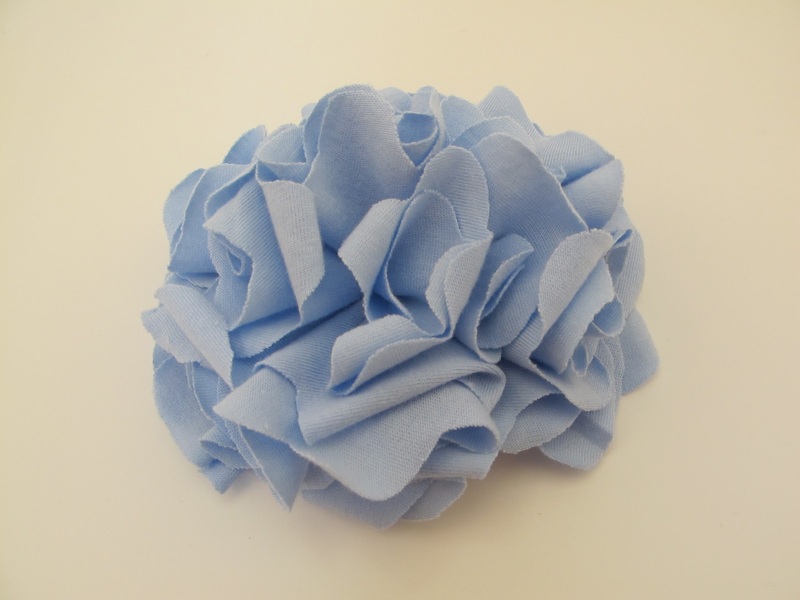 I would love a flower in blue or purple. I can't to try these! I love your flowers! I have been wanting to make some of them. I would love to have a red or grey one. 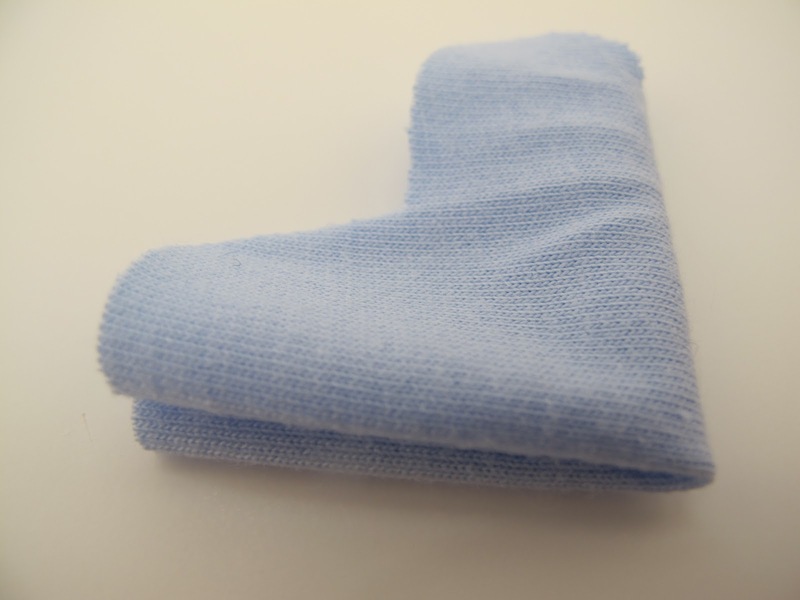 Oh my goodness, I love these found them at fireflies and jellybeans link!! May have to try to make them today, but would love to win a blue or pink!! Thanks! These are so pretty! And you make it sound so easy, but I just know I'd find a way to mess this up!